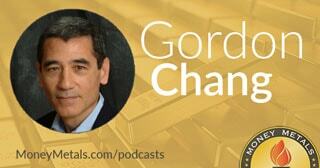 There’s been some big news out of China lately, and today we’ll dive deeper into the discussion when we hear a recent interview I did with Gordon Chang. Mr. Chang is one of the foremost experts on the Chinese economy and has written a book titled The Coming Collapse of China. He’ll tell us why he believes an epic collapse is imminent and what it all means for the Western financial world and why he believes there is what he calls a Chinese floor on the gold price. Don’t miss an incredibly eye opening and enlightening conversation with Gordon Chang, coming up after this week’s market update. After being hit with a barrage of heavy selling during the first few days of October, gold and silver markets have stabilized. Precious metals traders largely shrugged off this past Wednesday’s release of the Federal Open Market Committee’s latest meeting notes. The most notable Fedspeak to come out of the September meeting was the term “relatively soon” – as in the central bank intends to hike interest rates at some undefined point in the future. Perhaps in December if market conditions are favorable. However, if markets suffer a severe drawdown after the election, then perhaps “relatively soon” will carry over into 2017 or even beyond. A few meeting participants dissented from the Fed’s decision in September to refrain from hiking. They specifically expressed concerns that the FOMC “risked eroding its credibility.” They talked as if the Fed hasn’t already eroded its credibility. Saying one thing and doing another month after month has consequences. Fed officials offer various excuses each month about the economy not quite performing as well as they had hoped. But there is now a widespread perception that the Fed isn’t hiking ahead of the election for political reasons. This is an election like no other in recent memory – one in which most organs of the mainstream media have abandoned even the pretense of objectivity. Hillary Clinton and her media and Beltway allies portray Donald Trump as not merely wrong on the issues, but unfit as a person to be president. Trump and his supporters say Hillary Clinton’s actions as Secretary of State make her unfit to be president. It’s quite likely that if she were just a lower level State Department bureaucrat, she would be facing prosecution over her mishandling of classified material. She certainly wouldn’t be deserving of a promotion. Whoever ends up winning will be among the most disliked and least trusted new presidents ever to be inaugurated. Well, when it comes to investing, the best values often emerge from the least liked assets. When a market is hated by the public, or viewed with doubt even by bulls, it’s usually a good time to buy. Right now the gold and silver markets face a lot of doubters who aren’t convinced the rally seen in the first half of the year puts the metals in a major bull market. We’ve certainly seen a sharp pullback in precious metals prices. Both gold and silver are still holding above their 50-week moving averages. Until proven otherwise, the long term trends remain positive. As of this Friday recording, gold prices come in at $1,254 an ounce after a small 0.4% decline this week. Silver, meanwhile, is off 0.9% since last Friday’s close to trade at $17.46. The gold to silver ratio has moved up in favor of gold over the past month. That’s normal during market downturns, as silver is the more volatile metal. For the year, though, silver is still outshining gold in terms of price performance. And when the next big rally hits the sector, you can expect silver to outperform the yellow metal. For silver investors who want to own low cost legal tender coins, Money Metals is pleased to announce that we have just been designated as the only dealer worldwide for the stunning new 2017 “HMS Bounty.” This .999 pure silver coin from the New Zealand Mint is the lowest priced 1 oz legal tender silver coin in the world. The content and purity of the New Zealand Bounty are identical to those of silver American Eagles, yet premiums are MUCH lower. The Bounty is not only an outstanding value in legal tender silver, it’s also a spectacular coin. The reverse depicts Her Majesty’s Ship The Bounty under sail, circumscribed by an eight-point compass. The obverse features Queen Elizabeth II and bears the coin’s $2 legal tender denomination. The New Zealand Mint has been producing legal tender coins, bullion, and collectible medallions for more than four decades. It prides itself on high quality designs and production. Money Metals is offering the 2017 Bounty at only $1.99 over spot for smaller orders, and as low as $1.69 over spot if you buy 500 or more, making it the lowest price on any 1 oz government minted coin. Its weight, purity, and legal tender status are backed by the Reserve Bank of New Zealand. In addition to their primary value as a store of wealth against the fickle nature and uncertain future of fiat currencies, these beautiful coins will make outstanding Christmas gifts and stocking stuffers, helping instruct others on the wisdom of owning sound money and investing in precious metals. As always, all orders over $1,000 ship free at Money Metals – that’s about 50 1 oz New Zealand Bounty coins. There is no order limit, so feel free to buy as many as you want. Well now, without further delay let’s get right to this week’s exclusive interview. Gordon Chang: I actually don’t think so, especially what we saw starting in the second week of July (of last year) when they started to introduce their support measures for the equity markets. And then, of course, the still inexplicable devaluation of the renminbi, starting August 11 (of 2015). Chinese technocrats show themselves to be less than fearsome and less than competent. So I think that we sort of attribute to them mythic qualities which they don’t really deserve. Eventually, they will be able, I think, to stabilize their economy, and they’ve been trying to do that right now, but as they do that, they incur a lot of debt. They're still experiencing large capital outflows. So right now, although it looks like they were able to at least staunch the problems, they have some challenges I don’t think that they can meet. Gordon Chang: For a very long time, the People's Bank of China was telling us that there was no change in China's gold position. Then about a year or so ago, they announced a big increase all in one month. So obviously, their reporting is inaccurate and unreliable. I don’t know exactly, but my sense is that they are under-reporting their acquisition of gold. I can't point you to anything, but it's just a sense of where Chinese government policy is going. I don’t know what purpose that is for. Mike Gleason: The Shanghai Gold and Silver Exchange was introduced. It provides an alternative to the COMEX and other Western exchanges, which many believe are massively over-leveraged and highly controlled by the banks, some of whom have recently admitted to rigging prices. But investors need to be careful assuming the Shanghai Exchange won't be subject to problems of its own. What do you think the ramifications of the new exchange in Shanghai might be for the metals markets, and what do you think was behind the decision for the Chinese government to launch this competing exchange? Mike Gleason: How about the future of the Chinese Communist Party? I think I've seen you say somewhere where you're expecting mass riots and so forth as things unfold there in China. What do you think the ramifications are there? Check back here next Friday for our next Weekly Market Wrap Podcast. Until then, this has been Mike Gleason with Money Metals Exchange, thanks for listening and have a great weekend, everybody.